27 Sept. 2015: Once a week, and sometimes more often, Spaceweather.com and the students of Earth to Sky Calculus fly “space weather balloons” to the stratosphere. These balloons are equipped with radiation sensors that detect cosmic rays, a form of space weather important to people on Earth. Cosmic rays can alter the chemistry of the upper atmosphere, seed clouds, spark exotic forms of lightning, and penetrate commercial airplanes. This last point is of special interest to the traveling public. Our measurements show that someone flying back and forth across the continental USA, just once, can absorb as much ionizing radiation as 2 to 5 dental X-rays. This radiation profile was obtained on the evening of Sept. 27, 2015–incidentally, during a total eclipse of the Moon. The altitude of the balloon is on the horizontal axis, radiation dose rates are on the vertical axis. Inset photos show scenes from the mission. 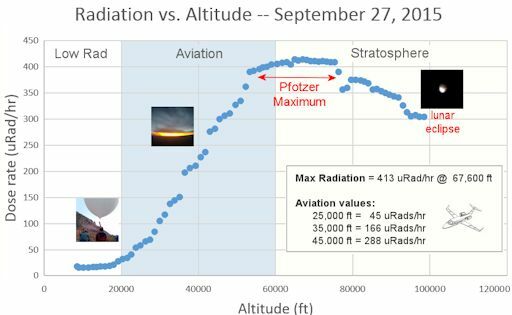 Radiation levels peak at the entrance to the stratosphere in a broad region called the “Pfotzer Maximum.” This peak is named after physicist George Pfotzer who discovered it using balloons and Geiger tubes in the 1930s. Radiation levels there are nearly 100x sea level. Note that the bottom of the Pfotzer Maximim is near 55,000 ft. This means that some high-flying aircraft are not far from the zone of maximum radiation. Indeed, according to the Sept. 27th measurements, a plane flying at 45,000 feet is exposed to 288 uRads/hr. At that rate, a passenger would absorb about one dental X-ray’s worth of radiation in 5 hours. The radiation sensors onboard our helium balloons detect X-rays and gamma-rays in the energy range 10 keV to 20 MeV. These energies span the range of medical X-ray machines and airport security scanners.